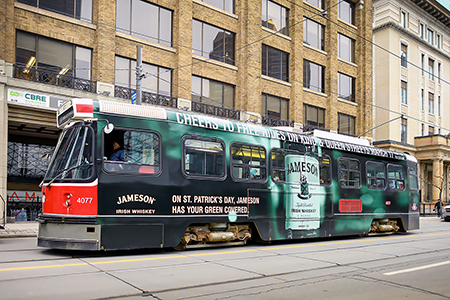 On March 17 2019, TTC customers will ride FREE from 4 p.m. to 2:30 a.m. on the 501 Queen, 504 King and 514 Cherry routes courtesy of Jameson Irish Whiskey, providing Torontonians with a safe ride to and from local St. Patrick’s Day festivities. To help revellers make the most of their St. Patrick’s Day celebrations, Jameson and the TTC have partnered with Canadian indie rock band Hollerado to perform for customers on select streetcars on these routes from 4-7 p.m.
Oh my God.. Hollerado rocks. What a great treat for many who will ride these streetcars on Sunday. Unfortunately, I will be riding the Spadina Streetcar. Happy St. Paddy’s..